Organize all and a lot of your vitamins, supplements and pills for entire week fast and confi. Thanks to this huge weekly pill organizer you will be able to hold your supplements and pills organized (one time a day) whole week even you take plenty of them. With this pill box 7 day you can easily open the lid and you can simply close it after by pushing the lid back. It will click to stay closed. 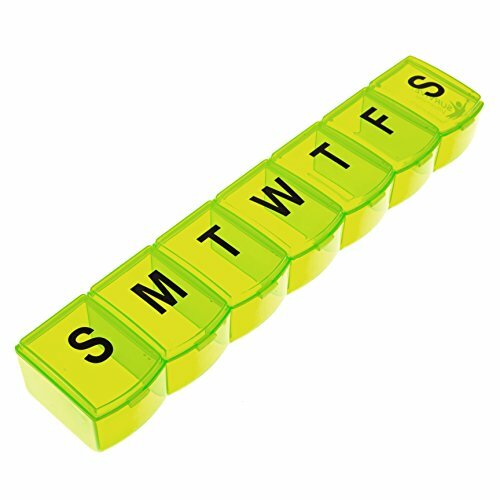 Big clear letters on the top of each lid of each compartment on this pill case will make it easy for you to know what day are you at now. It is made of nontoxic material. Buy 4 organizers at once and organize your entire month - it saves you a lot if time! GUARANTEE: 30 days money back! With a 30 Days Money Back Guarantee, You Have Nothing To Lose; Scroll Up To The Top, Click "Add to Cart" and Get Your LARGE 7 DAY PUSH BUTTON PILL ORGANIZER To Your Door ASAP before it gets sold out! If you have any questions about this product by SURVIVE! Vitamins, contact us by completing and submitting the form below. If you are looking for a specif part number, please include it with your message.